Soft Core is immediately surprising. 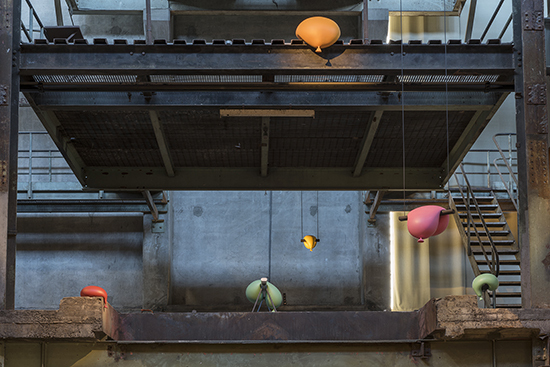 Hanging high in the Casula Powerhouse Arts Centre’s large foyer/exhibition space, Brook Andrew’s two huge balloons (The Weight of History, The Mark of Time, 2015) slowly inflate, deflate and change colours—unusual yellows, pinks, greens and blues. The intense black patterning on the balloons is “inspired by the wood carving of [the artist’s] mother’s Wiradjuri people” (wall note). These creations delicately and patiently project a sense of constant cultural renewal, their size underlining its importance. 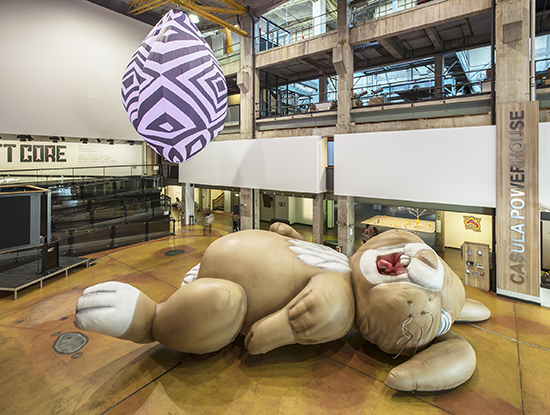 On the floor, immediately below and taking up much of the foyer space is an inflatable cartoonish rabbit, 12 x 4.5m, lying on its back, one eye closed, tongue hanging out—New Zealander Michael Parekowhai’s Jim McMurtry (2004). Although cute, the sheer size of this bunny is chilling, the artist’s reflection on the sheer scale of the impact of the rabbit on New Zealand’s ecology, a grim inheritance of colonialisation. Balloons make another appearance in an adjoining gallery, if much smaller, suspended from the ceiling or draped over girders with unexpected weightiness, intense colouring and a sense of indolence. Their unlikely anthropomorphic presence suggests potential movement as well as recalling the distorting objects in Salvador Dali paintings. These witty creations, the Oooh Aaah series (2016), are by Todd Robinson (read an interview here). His balloons, out of our reach, appear to be at once soft and firm, light but heavy, sagging, as if not quite able to support themselves. A cluster of works by Patricia Piccinini also evokes a sense of things near-alive: past life caught in bronze in A Deeply Held Breath (2009), life prematurely aged—a very realistic oversized baby in a carrier—in Foundling (2008), and mutant life in Ghost (2012), a disturbing suspended sculpture in which an amorphous torso with a long-haired groin hangs from a twisted car tyre. The desire to touch, to test the softness and the ambiguous reality of these objects, is dampened by their spookiness. 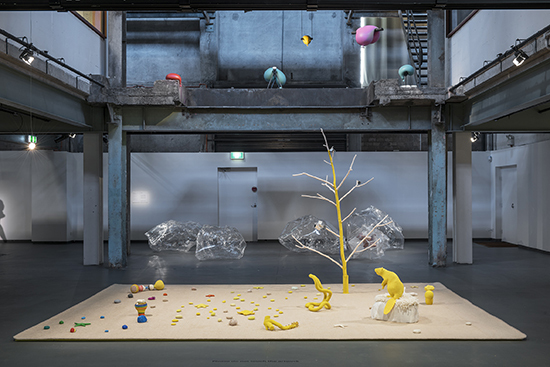 Mikala Dwyer’s Empty Sculptures (2008-12; she’s been making these since 2003 from transparent, hand-mouldable plastic) suggest roughly formed giant crystals, but air-filled, kin to the show’s balloons and inflatables. These appear, like Robinson’s balloons, intriguingly solid and ethereal at once. With her fantastical animals and a surreal landscape (no small wonder; 2005), Louise Weaver introduces to Soft Core different kinds of softness—the distinctive tactilities suggested by lambswool, cotton, silk and synthetic fur and the traditional crafts associated with women, including knitting, embroidery and crochet. Weaver’s view of the world playfully integrates nature and culture. 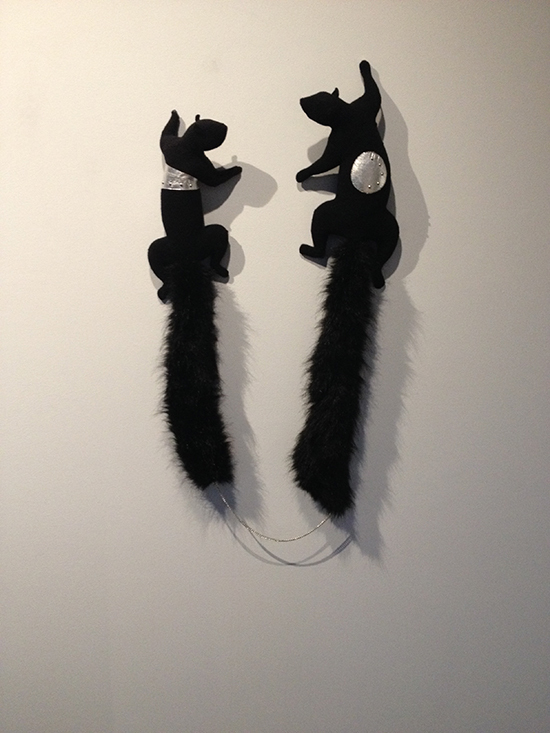 My favourite work has a very touchable pair of intensely black squirrels—Moonlight becomes you (two squirrels), (2002-3)—poised half-way up a wall, each adorned with a silver brooch and their very long, very furry tails joined by a hanging silver chain, rendering them, if problematically, a desirable decorative acquisition. Another soft/hard dichotomy. American artist Tony Oursler’s video sculpture, Spectar (2006), in the show’s third space is the only work to engage directly with media technology and with sexuality (Piccinini’s Ghost aside)—something of a surprise given the exhibition’s title. With images of mouths and eyes, small and large, projected onto it, the human-scale, bulbous fibreglass sculpture assumes the three-dimensional softness of a surreal limbless body, awash with rich colours sliding over its rounded protuberances. Behind it turns a starry cosmos as breathy voices urge each other on, ramping up the work’s strange eroticism. Softness here is entirely illusory. Infinitely more down to earth is Japanese artist Koji Ryui’s installation of detritus found in Casula Powerhouse. 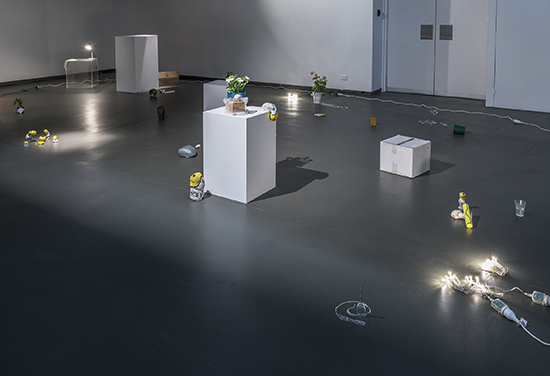 As with Robinson’s balloons and Weaver’s creatures, little scenarios spring to mind as one takes in the random spread of apparent incident laid out across the gallery floor: a broken wine glass, a dragged flower trailing dirt, an object fallen from its plinth. Personalities emerge in the form of “Have a nice day” plastic bags filled with perhaps sand and moulded into rotund little creatures of various sizes scattered about the installation or left waiting in a cardboard box. Some hang limply on the edges of plinths, wittily honouring Robinson’s balloons. Others gather around half-eaten food, as if stilled by my presence. This is sculpture softened up and wittily responsive to the everyday. 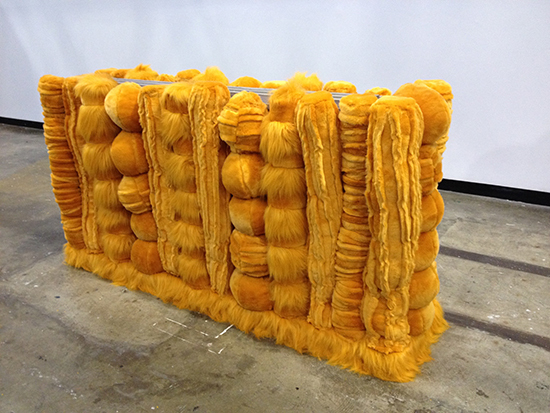 On the mezzanine above the foyer, Kathy Temin’s wonderfully furry orange monuments and pet tombs and a delightfully formal Purple Tree (2105) comprise a contemplative world of their own, of past or alien cultures, or something closer to home—a range of monster cat clawing stands. Brook Andrew’s balloons loom just above me and a downwards glance brings me eye to eye with Michael Parekowhai’s Jim McMurtry—is that rabbit dead or just down for the anti-colonial count? For an exhibition in which I had to constantly suppress the desire to touch, Soft Core proved to be a thoroughly engaging visual experience (there are more fine works than I could mention here), revealing an impressive range of contemporary sculptural practices and detailing multiple degrees of softness, real and imagined, sensual and contemplative, and fun. Soft Core is within relatively easy reach of people living in Western Sydney and, by train, not too far for Sydney-siders. The train from Central takes an hour (if you select the right one), depositing you at Casula Station for a five-minute walk to Casula Powerhouse (open all week), and the trains are frequent (check for track work). Soft Core will tour to eight regional venues in NSW and Victoria. The catalogue, which will include tactile elements and critical writing about each artist, will be available shortly.